A Moon Jump 4U�s newest inflatable bounce house called The Candy Playland Jr. Combo, it is 16' deep, 19' wide and 10' tall, and can be set up indoors or out. 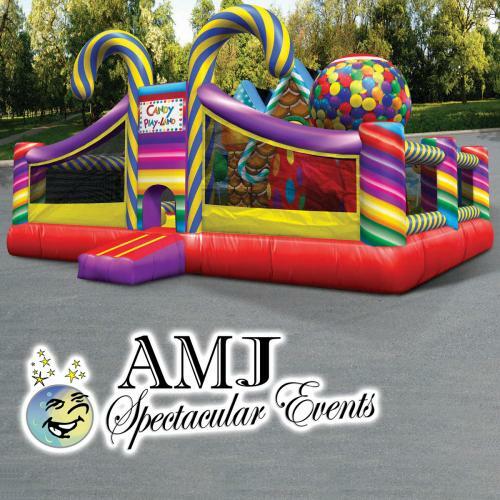 AMJ�s Candy Playland is a colorful candy-themed inflatable for the younger crowds. (But parents of the wee little ones will still be allowed to join in on the fun. with a max weight limit of 350 lbs) This colorful moon jump will bring life and excitement to every party or event it is one that is sure to really get the party going! With the towering candy canes and Giant Gumball Machine as an attention getter, your party will be the talk of the land! Start by kicking off your shoes and climb into A Moon Jump 4U�s newest, most colorful and inviting inflatable, Candy Playland! This is a "magical" road to "sweet" surprises! Do you want to be Mally Mallo or Giggly Gumdrop? Remember them? Your little sweeties will be able to pretend that they are a sweet character and then dance your way along the rainbow path to LolliPop and Candy Corn Forest, through the giant Gumball Tunnel and bounce around the Happy Gum Drop Tree and around and through the Gingerbread House, just like in the classic board game! Let your imagination soar as you and your children jump, laugh and play in this bright candy themed moon jump. Does your school or corporate event need an activity that brings beautiful extra pop of color? Well this Candy Playland Jr Combo inflatable bounce house is the best rental for you, full of color and pleasing to the eyes of all. When your guests see this amazing and colorful activity they will be lining up to jump around! The large mesh windows on all sides adds to the fun because your guests can keep an eye on the kiddos while still enjoying the party. And the kids see and hear all the fun that is happening within the bounce house-they will definitely need to get their time in on this bounce house! The smile and endorphins will be flowing after some time playing in this new AMJ moonjump.